Live in this beautiful and carefully restored barn in a quiet location overlooking the surrounding countryside. This beautifully restored barn is located in the beautiful countryside, 15km North West of Florence.This former farmhouse has been successfully transformed into a comfortable holiday home, oozing with character and elegantly decorated. The living room is spacious and open plan with an open fireplace at the centre, and a long dining table for those typical Italian family feasts. There are two nicely appointed bedrooms and an equal amount of bedrooms sleeping up to seven guests.The large fenced outdoor area equipped with garden furniture, and BBQ, ideal for outdoor dining. Should you wish to cool off during the hot summer days, the swimming pool is just a couple of steps away from the house.Please be advised: Private equipped garden with barbecue available for guests. The owners live in the manor house next door and occasionally use the pool. This solidly constructed villa was originally built in 1800 and refurbished in 1997. The agent has rated it as a five star property so it is one of their best villas - tastefully furnished and fully equipped. It is also great value for money. 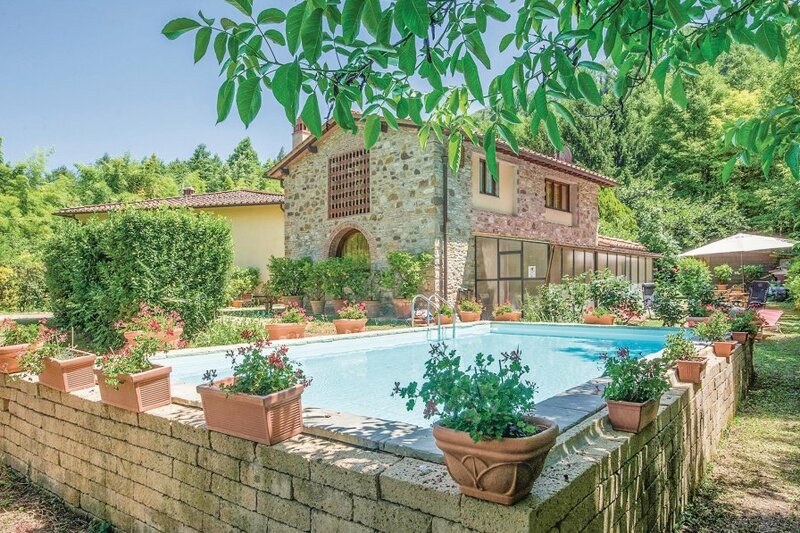 This villa has a swimming pool and view over the landscape; it is also located in Pontassieve, only 15km from Firenze. It is set in a good location: there is a restaurant 2.5km away.